Dear Readers, many years ago I lived in a flat which looked out onto Wanstead Flats, an area of ancient common land in east London. Cows used to graze there during the spring and summer, and they occasionally wandered into my tiny front garden, where they ate all the daffodils and tore out the winter-flowering pansies. If I threw open my front door to remonstrate they merely raised their heads, blossoms dangling from their jaws and a look of complete indifference on their faces. Sometimes they would make their sedate way up the side of the block to the car park and back ‘garden’, which was a mass of concrete split occasionally by thistles and dandelions, and even these would be mulched down by my bovine visitors. The only plants that survived were the brambles tumbling onto my ‘patio’ from the house next door, and the great knotted thickets of Bittersweet that scrambled through it. 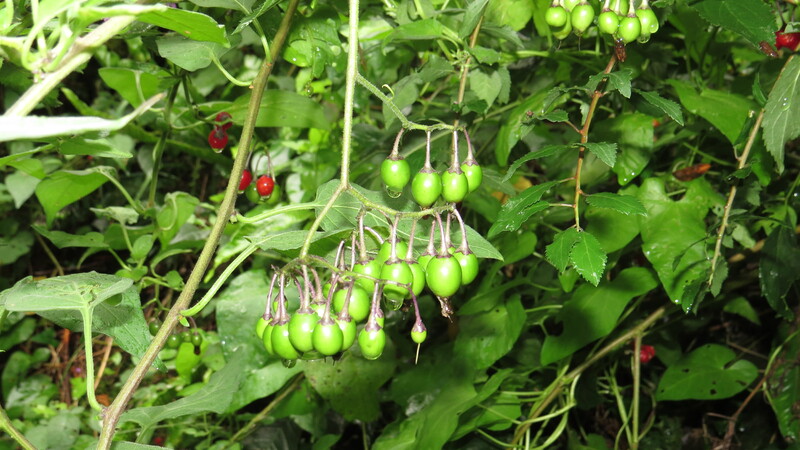 Bittersweet (or Woody Nightshade) can be found in most woodlands and looks like some exotic vine, with its purple and canary-yellow flowers, and translucent cerise berries. Its leaves are said to smell of burnt rubber. 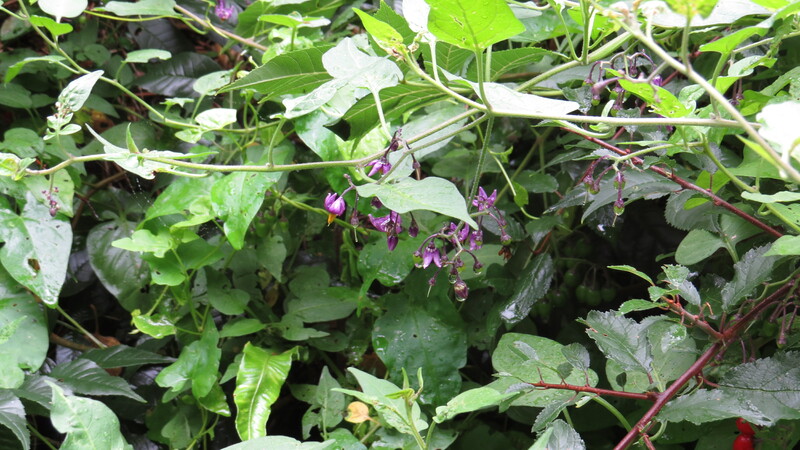 It is a member of the Solanum genus, which includes tomatoes, aubergines and potatoes, but also Deadly Nightshade, for which this plant is sometimes mistaken, although the berries of Deadly Nightshade are black. 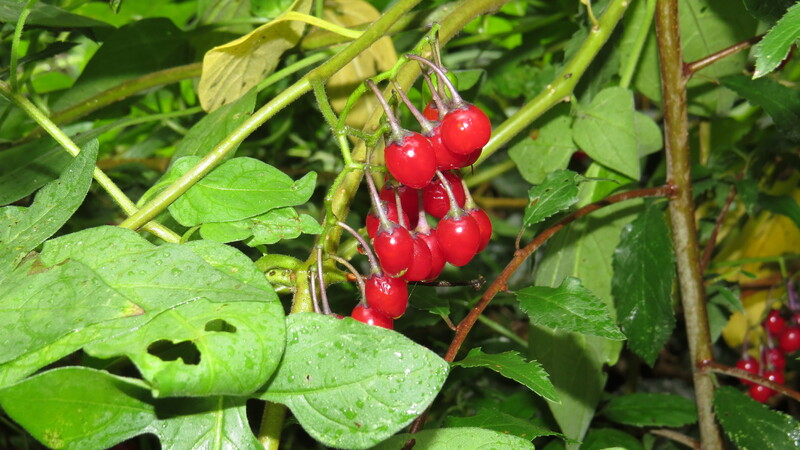 The red berries of Bittersweet look delicious, but John Robertson, the author of my go-to blog on ‘dangerous’ plants The Poison Garden, states that they have an extremely bitter taste, which does not become sweet regardless of the length of time that they are chewed. A nine year-old girl did die of what appeared to be Bittersweet poisoning in 1948, but she must have been either very hungry, or, as Robertson speculates, have had an impaired sense of taste in order to eat enough for a fatal dose. 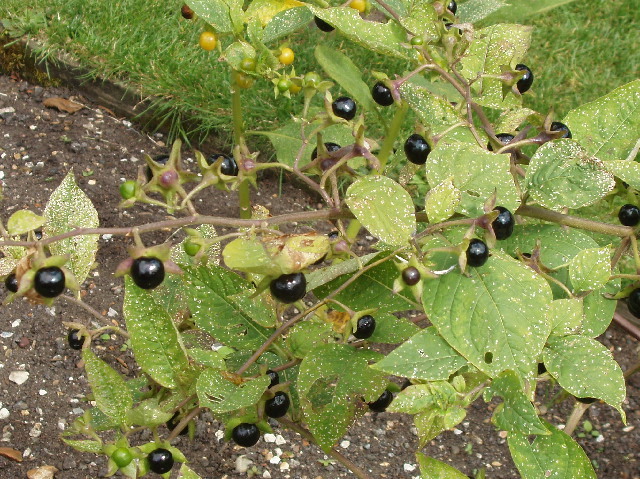 However the Modern Herbal website suggests that the name Bittersweet refers to the taste of the root and stem rather than the berries. I wonder if the berries merely look as if they should be sweet, and in fact taste disappointingly bitter? The species name ‘dulcamara’ means ‘sweet-bitter’, and maybe this is the simplest explanation. The genus name, ‘Solanum’ is said to have derived from the Latin phrase for ‘ease’ or ‘solace’, and it has been suggested that the plants were used for their sedative properties. Another name for the plant, ‘Felonweed’, refers to its use for abscesses of the fingers or toes (known as whitlows these days, but formerly known as felons). 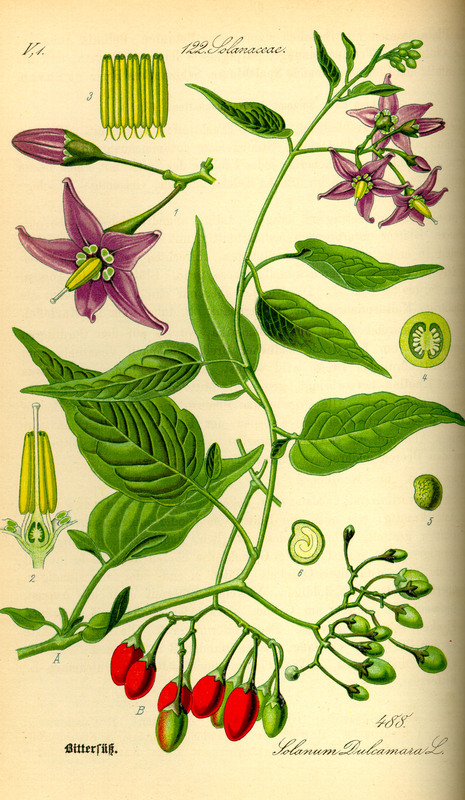 Bittersweet has also been used for a variety of skin conditions, including eczema and scrofula. In the UK, a garland of Bittersweet used to be hung around the necks of sheep who were suspected by their shepherds to be under the ‘evil eye’, and horses that appeared to be ‘hag-ridden’ were given a necklace of Bittersweet and Holly. In Lincolnshire it was pigs who were protected with Bittersweet. Writing about this, I find I have a lump in my throat as I think about the days when farm animals were seen as individuals, with needs and personalities, rather than as the generic production units that they have so often become today. This attention to the needs of the animals in our care, this strange tenderness, still lingers on in small farms and in wild places, but has no place in an intensive pig unit or a battery farm or a mega-dairy. So many animals pass from farm to plate not only ungarlanded, but unregarded, their short, miserable lives a testament to our ability to separate ourselves from the creatures that surround us, and to our tendency to inflict things on others just because we can. ‘on the third collarette of Tut’ankhamun’s third coffin, and shows the fruit threaded on strips of date palm’. The collar appears to have been made up of red Bittersweet berries and blue glass beads and it seems that the Egyptians also had a tradition in which the plant was protective. There is something about Bittersweet that makes me think that it not to be messed with. Of course, when we comment on the ‘personality’ of a plant it is more likely to be about how we see it at the time than about the plant itself, but still. The more time I spend with plants, the more I am convinced that they are not just a green back-drop to our everyday lives, but are rather more active than their sedentary nature would give us to suppose. There is much to be gained by regarding our botanical neighbours as members of our larger communities rather than as ‘things’ to be exploited or ignored. After all, without plants we would have no oxygen, no food and no atmosphere. A little respect seems a small price to pay. 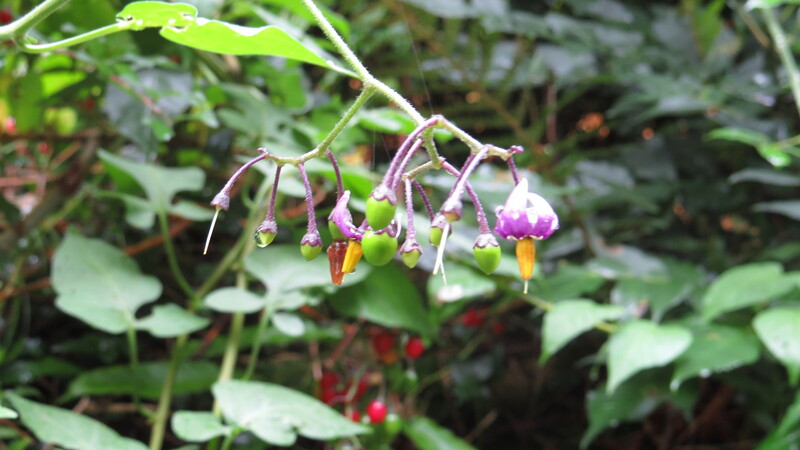 This entry was posted in London Plants on November 11, 2015 by Bug Woman. You are so right on about plants having personalities…with a true ability to communicate as well. Have you read any of Stephen Buehner’s books or Pam Montgomery’s book, Plant Spirit Healing? I haven’t, Marla, but they’re on my list for sure! Your comment about disregarding other non human life is something I’ve spent most of my adult life feeling strongly about and doing what I can to redress the balance , so glad you share that sensibility. I am always amazed at how we can take account of the feelings of our pets and yet condemn other creatures to unspeakable suffering, Julia. As a species, we seem to have an ability to compartmentalise that doesn’t serve the reality of the connections and commonalities between all living things. Our collective empathy muscle could certainly do with more work.